There are many plants you can grow indoors, from the easy but predictable spider plants, aspidistras, rubber plants and yuccas, etc to more unusual species that will need some careful looking after. Or you can plant bulbs – and almost watch them growing once they emerge from the compost. If you have a garden it is easy to bring in flowers just before they are about to flower. Almost anything can be put in a tub and brought indoors, from fox­gloves, forget-me-nots, lilies and to­bacco plants to larger pots of lilac and winter jasmine. Bulbs are always easy and cheap to grow-indoors and a mass of flowering bulbs will make a stunning display, especially in winter when there is little else around. Plant bulbs anywhere: in soup tureens, china pots, old basins, baskets or glass vases and keep them as cool as possible. Amaryllis, narcissi and hy­acinths will herald in the spring most effectively, but keep colours pure. If you are not sure of the colours of your hyacinth bulbs, plant each bulb sepa­rately – you can always group all the pots of the same colour together once you can see what they are. Hyacinths also bring a wonderful scent into the room which is an added bonus. Evergreen plants will, of course, look good throughout the year but they may never look stunning. The type of con­tainer you put them in will help, as will the location. It is worthwhile hunting for unusual containers, such as old bird­cages, hollow china heads, decorated watering cans as well as deep china bowls and beautiful terracotta pots. It is also worth taking trouble to find an unusual spot to place the plant in and then to light it well. The most effective solution may be to use flowering plants together with evergreens. Primulas, cyclamen, violets and azaleas all provide a splash of much-needed seasonal colour which, when combined with ivy, tradescantia or a vine, would make a longer-lasting ar­rangement. Alternatively, you can buy a stunning white-scented jasmine or bougainvillaea and train it all along the wall of a bathroom. 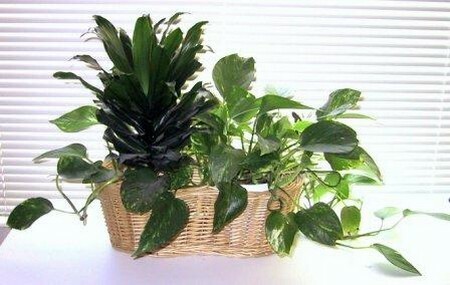 When buying houseplants, make sure the stems are not spindly and that the leaves are not damaged. They should also have a ‘care’ label which will tell you of any special requirements. Most houseplants are easy to look after, but they do not like draughts, changes in temperature, too much or too little water, overfeeding or too little food or too long a period in bright light or darkness. They must also be grown in special potting mixture; never place houseplants in garden soil, which can harbour pests and diseases as well as being too coarse. Plants should almost dry out before they are watered and should only be watered when they really need it. Ideally their soil should be kept almost continually moist but not soggy. Plants naturally need more water during their period of growth. If you can, water plants with rain water, otherwise use tap water of room temperature and, if possible, water the soil rather than the plant with a long-spouted watering can. Fill the pot to the rim with water and then let it drain out of the bottom of the pot and collect in an outer pot or plant tray. Check the plant half-an-hour or sit after watering and drain away any excess water that still remains in the outer tray. Some plants, including cyclamen, African violets, miniature orange and lemon trees, can be watered from below. Stand the pot in water to just below the level of the compost and leave it to soak until the water starts moistening the soil. Let the pot drain thoroughly before replacing it in its container. Never leave a plant that is not semi-aquatic standing in water or it may begin to rot. Keep plants humid, especially if there are radiators on in the house. Spray them regularly with tepid water and leave pots of water standing around the room. A humidifier will offset the drying effect of radiators. During their growing and flowering season, plants should be fed once every two weeks with liquid fertilizer. Buy the correct feed and give too little rather than too much. Newly potted plants need not be fed for a couple of months. 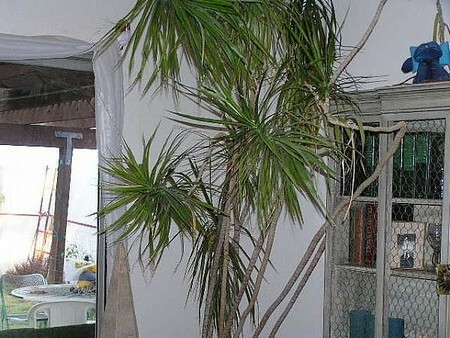 Most plants tend to grow towards the light, so turn them regularly for even growth unless you wish them to grow across a wall towards the window. A general rule is that plants with variega­ted or coloured leaves need good light, plants with dark green foliage can sur­vive in shade. Most plants like semi-shade better than direct sun, which can burn their leaves.